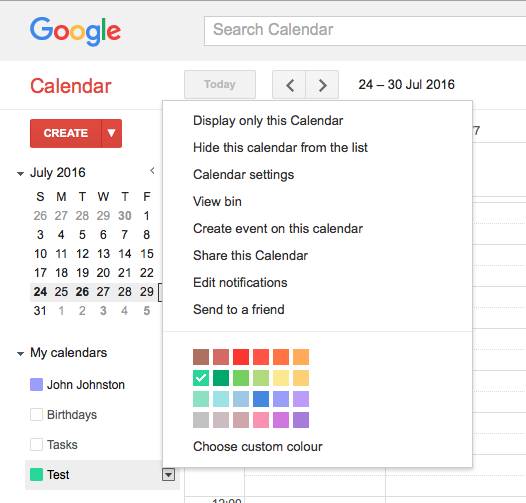 This plugin will allow you to embed Google Calendars in Posts pages and in a Widget. You then need to get the embed code from the Google Calendar you want to embed. The Calendar must be public. You may want to click the customise link, which will allow you to change the size, colours etc. You might want to set the size to fit into your post. You can also display a Calendar in a widget on the sidebar of your blogs. There is an example on the right of this page. To add a widget you need the code again, it might be best to adjust the size by customising the code. Copy the code on the calendar site. Add a Widget, Dashboard-Appearance-> Widgets, where you will find the Google Calendar Embed Widget. Note the code is not changed to a shortcode. The above code will produce the calendar widget you should see on the right of this page. Note, we limit the widget to appearing just on this page with the Jetpack Plugin’s Widget Visibility module.